On a lazy Sunday drive into the Blue Mountains west of Sydney, I like to head out on the Great Western Highway, and then return via the more northerly route of Bells Line of Road, which is more scenic and has less traffic. Along the way you pass through the small settlement of Bilpin, which with its cool highland climate, is a great place to grow apples and stone fruits. Lining the road through this area are several roadside stalls where you can stop and buy fresh fruit and vegetables. Some are mere shacks, while a couple are larger and offer tables and cafe refreshments. 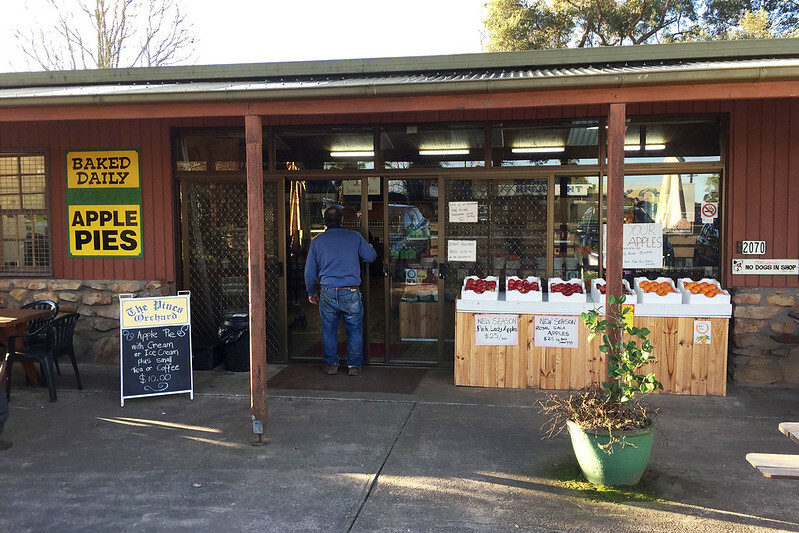 On this day we stopped for an afternoon break at The Pines Orchard Cafe, right across the road from the more well known Bilpin Fruit Bowl with its giant colourful fibreglass bowl of fruit out the front. The Fruit Bowl has a small kitchen right in the middle of the shop, where ladies make and bake apple pies seemingly constantly, and you can buy them either hot out of the oven, or cooled down to take home. The Pines Orchard is not quite so fancy, but upon entering and perusing the bakery cabinet I spot something which looks like a vanilla slice. They’re square cut slabs resting in a tray, topped with a delicious looking layer of passionfruit icing. Mrs Snot Block & Roll wants to get a coffee, so I ask her to add a vanilla slice to her order and I head across the room to find a table.